Maybelle can't sew. But when she finds an unfinished quilt in the attic of her mother's house, she gets the crazy idea to complete it. At first, it's just a way to fill the lonely nights while her husband, staff sergeant Holden Kanzinzki, is away fighting in World War II. 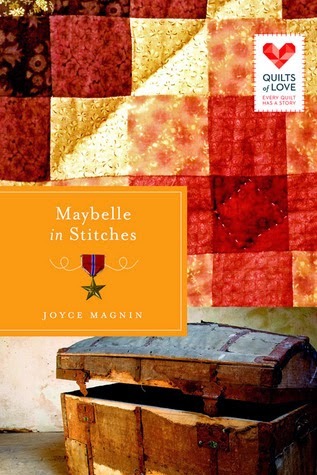 Yet when Maybelle discovers that the quilt is made from scraps of material that can be traced back through her family heritage, the project is suddenly much more important. Then word comes that Holden is missing in action, and with little else to do, Maybelle clings to the quilt as much as to the hope that her husband is still alive. As neighborhood friends gather around Maybelle to help her through the unknown days and nights ahead, it is the quilt that becomes a symbol of her unflagging belief that Holden will return to her, to their home, and to their quilt-covered bed. This book depicts the day-to-day life of Maybelle as she waits for her husband, grieves for her mother, and interacts with her roommates and co-workers. I was surprised at the lack of attachment Maybelle feels for the quilt since she feels so inadequate at sewing. Her friend is the one pushing her to complete it as a way to cope with her grief, and eventually the quilting parties become a way to connect and bond with those around her. Her thoughts of loneliness become repetitive by the end of the book, but I'm sure that is close to what those enduring the war endured.